Racing season is right around the corner and my first event, the 100 mile ADA Tour de Cure in Napa, is in 4 short weeks. To prepare, I've been increasing the duration and intensity of my workouts which has significantly increased my insulin sensitivity and affected my diabetes management. So far, Dexcom has helped me manage these changes. As I mentioned before, one of the toughest challenges with exercise and diabetes is the post-exercise hypoglycemia. Learning from my previous overnight low experience with Dexcom, I set the receiver's low threshold to 90. Over the next few days, I took my bike for two long rides. The nights following those intense workouts, Dexcom woke and warned me of the overnight low before it was too late. "Too late" means waking up shaky, sweaty, starving, etc. Thanks to Dexcom, I was able to correct with a few glucose tabs and then go back to bed. The mornings following those two nights, I woke up with BG's in the 100's. This is makes the expense of the Dexcom worthwhile to me. I was surprised, excited, and honored to see My New Friend Dexcom listed as a web site for "more info" on sensors. Thank you CWD. Dexcom and I are preparing to hit the ski slopes of Lake Tahoe. I'm sure we'll have some exciting stories to share. I do not work for nor am I compensated by Dexcom in any way. I'm writing this story because I think continuous glucose technology is interesting and exciting. Also, I am not a health care professional and do not give medical advice. I will share my experiences, but please check with your health care team before making any changes to your diabetes or health management. The next Gary Hall Junior? 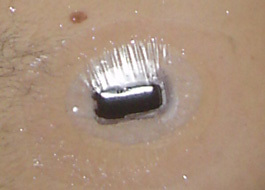 Shower patch with IV Prep. I believe it's better to manage diabetes around your life, rather than allowing diabetes to take control. 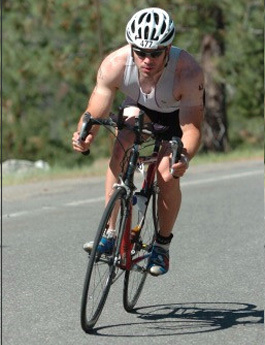 Swimming, biking, and running are a few of the things I enjoy doing in my free time. My friend Dexcom and I had already tried biking and running, so I thought it was time we took our first swim together. Surprisingly, we both had a great time. 1. Pay someone to walk along the pool deck following me within five feet lap after lap. This seemed expensive and not very realistic. 2. Attach the receiver to a floating buoy and pull it while I swim. "Where am I going to find a mini-buoy?" I thought to myself. 3. Tuck the receiver into my swim suit, next to my insulin pump. Risky, but probably the best choice for me. Even though the receiver is water resistant, it's not made to be submerged under water. 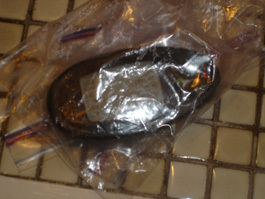 I double bagged the receiver with heavy duty Ziploc freezer bags and carefully sealed each bag. The bags were clear, so I could easily see the receiver's screen. The entire Dexcom waterproofing process took about 30 minutes. I jumped in the pool, swam a few laps, and then inspected the receiver bags and shower patch. Everything looked watertight, so I continued my pool workout. 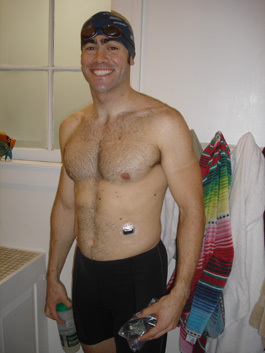 The sensor was comfortable to wear in the pool, the receiver felt a little bulky in my shorts and probably created some drag, but overall Dexcom didn't interfere with my stroke. I constantly checked the sensor and receiver's status looking for any indication of leaks and monitored my glucose levels. After 60 minutes of freestyle, breaststroke, kickboard, and flip turns, Dexcom's first swimming lesson was over. I was extremely happy that the swim test was successful and the shower patch and Ziploc bags kept the water out. According to the receiver, I started swimming with a 174 and steadily dropped down to 126. According to the data, it seems my diabetes management routine for swimming works well. I rarely swim for over an hour, but if I ever need to go longer, a few sips of Gatorade or a packet of energy gel should help maintain my BG levels. Back in the locker room, a finger poke revealed a 135 value which was very close to Dexcom's reading. Although it was interesting to see my BG's, my paranoia that water may be shorting out the system didn't really make the experience worthwhile. Dexcom does not recommend taking the STS Continuous Glucose Monitoring System to the pool, lake, ocean, or water park. Any such action that results in a malfunction of the system is not covered under the manufacturer's warranty. I took a $500 risk swimming with Dexcom, I probably won't do it again, and I don't recommend you do it either. After a shave and shower, I put on my best formal wear in preparation for the Sacramento JDRF Gala. At the event, I took great pleasure showing off Dexcom to both old friends and new acquaintances. Just before dinner, I started to feel a little lightheaded and just then Dexcom vibrated and gave me a "LOW" BG alert. A finger stick reading of 69 confirmed the alert, I ordered an OJ from the bar, and headed towards my table. "I really owe one to my friend Dexcom for spotting that low," I thought to myself. The gala was amazing and thanks to the hard work of Judy Fern (executive director), staff, board members, volunteers, and gala attendees, over $240,000 was raised for the JDRF! Just before bed, Dexcom said 210 and a finger stick read 205. I gave a correction bolus for the 205 and went to sleep. At 2:14 am, I woke feeling shaky and extremely hungry. It felt like a low, but I thought I should check to make sure. I pushed Dexcom's buttons and the backlit display read 81 with a flat trending graph for the past hour. An Ultra finger stick test read 45, which seemed more realistic. I stumbled to the kitchen, drank a Gatorade (40 grams of carbohydrate), and ate a granola bar (25 gm carbs). I found my bed and fell back asleep. A few minutes later, I was woken up by Dexcom vibrating, beeping, and flashing a "LOW 55" alert. Another Ultra test gave me a 95 reading. Dexcom was a little late, due to the interstitial fluid lag time. The food was obviously working, but the granola bar was probably too much, so I bolused 1.65u of insulin to cover the extra carbs, and slept for the rest of the night. The next morning I woke feeling a little groggy. Dexcom read 315, which I found very hard to believe. A finger stick was a pretty close reading 283, so I went to Dexcom's 9 hour graph to find out what happened. My BG had been steady, around the mid-80 range, for about an hour until 2:00'ish when it dropped below 55 for two readings, then skyrocketed to the high 300's within 30-60 minutes. My BG had pretty much stayed in the 300's until I woke. With this retrospective data, I was able to confidently form a theory to explain the overnight BG phenomenon. Due to the day's increased exercise (swimming), my muscles were low on glycogen, and at 2:00am my body replenished the glycogen stores with the glucose in my blood. Since my BG was around 80, the glycogen replenishment caused sever hypoglycemia. My body sensed the low, woke me up, and told my liver to take counter-regulatory measures (dump your glucose stores now). The 40 grams of carbs I ate pushed my BG up even further and my liver secreted insulin resistance causing hormones, so my BG stayed high. This is just a theory, so if you have some expertise on the subject, I welcome your insight. It would have been nice if Dexcom had warned me of the low BG before I woke up, but the reality of interstitial fluid's time lag made it impossible for this system to react in time. My solution for next time: The night after a moderately intense workout, I will set Dexcom's low BG threshold to 90 or 100. This way, I can play it safe with a slightly higher BG and help prevent the 2:00am glycogen replenishment from causing another hypoglycemic reaction. Post-exercise overnight lows are extremely scary, frustrating, and potentially dangerous. Thankfully, I wake up if I'm low in the middle of the night. I usually wake up sweaty and shaky, feeling like I could die if I don't have something to eat right away. All I really need to correct the hypoglycemia is 15 to 45 grams of carbs. However, since it takes 15 to 20 minutes for my brain to tell me I'm alright, I typically empty the fridge of all its sweet treats, which is 3 to 5 times more carbs than I really need. I then wake up the next morning with an extremely high blood glucose value. After a night like that, I will be so insulin resistant that my BG's will be high and I'll feel sick for most of the next day. Although I wasn't happy about my BG's being in the 300's for most of the night, I felt empowered, thanks to Dexcom, to know what happened while I was sleeping and have a plan to prevent this from happening again. So far I've realized that collecting data, analyzing results, writing the story, and publishing my finished blog takes a significant amount of time of energy. In order to maintain my real job, personal relationships, exercise routine, and overall sanity, I will do my best to have fresh content for you at least once a week, maybe twice (Monday and Thursday). Thank you very much for your comments, questions, and stories. I look forward to writing again soon.